The 3m x 2.25m is very popular without a doubt. They are big enough to store all your gardening equipment (including larger machinery such as ride on mower) but still fit comfortably in most suburban backyards. They are also a popular option as a smaller workshop. There are amazing possibilities to customise your shed and add a wide range of accessories. You can increase the standard 1.8m wall height to 2.1m but this is just the beginning. You can change the hinged doors to sliding doors, add louvre window, skylight, shelving, tool holders and the list goes on. It comes with 20 year warranty. 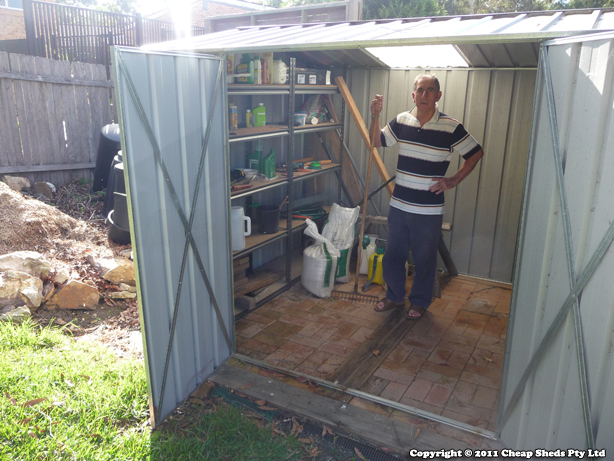 I use my shed for a garden shed; to store the bigger and bulkier of the garden tools and free up some space in my garage. My wife had been “motivating” me to get and erect a garden sheds for years and I believe had reached the point that she believed I never would. I knew that it would eventually happen. My wife almost couldn’t believe it when I did order your shed. I am pleased with the results and so is my wife. just a quick word about your shed. I was a bit worried about putting up a garden shed, i live on a coastal headland and watched a storm rip my neighbours garden shed apart and it was a bit protected by the house and fence, where i had to put mine was right out in the open to cop the full force of the weather and wind, i was going to weld up my own frame and sheet it. but i ran out of time and grabbed on of the easy sheds, when i assembled it i threw away the tek screws and used 250 pop riverts i am totally surprized at how strong it is..the day after i got it up we got battered by a storm that lasted over a week...very happy Rob. Good customer service: After a bit of stuffing around on our part as an organisation, we still recieved the special after the deadline and the customer service was courteous and helpful.